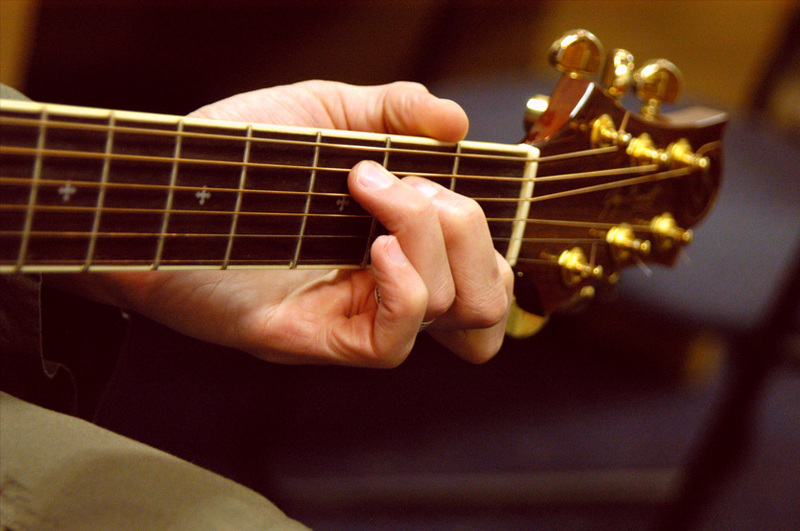 As every beginner guitarist will know, it takes some time for your fingers to become friends with the strings. In other words, pressing them down against the fret board repeatedly and for extended periods of time will make you want to shout things that aren’t radio-friendly. What most people then do is to hook their thumb around the top of the fretboard for extra leverage, which only results in leaving your incriminating fingerprints on the fretboard rather than pressing down the strings with your fingertips. This is called the ‘death grip’. To combat this, always make sure you keep your thumb on the back of the neck, which will help you use your fingertips, and in turn produce the clean and pleasant sound you expect. As with any exercise, this will feel awkward and difficult at first because your wrist lacks strength – the only way to strengthen it is to practice regularly. Patience is, as always, a virtue, and regardless of how excited you are to pull off a new chord sequence – slow down. Learn to crawl before you run, or you will fall on your face and get frustrated. Comparing your own technique to that of more seasoned guitarists will quickly ruin your motivation. Focus instead on getting each chord right, and speed will come with time and practice. That said, you should make sure you do increase your speed with time. Staying at the same slow speed usually means you have developed a bad habit that makes it impossible for you to increase your speed. 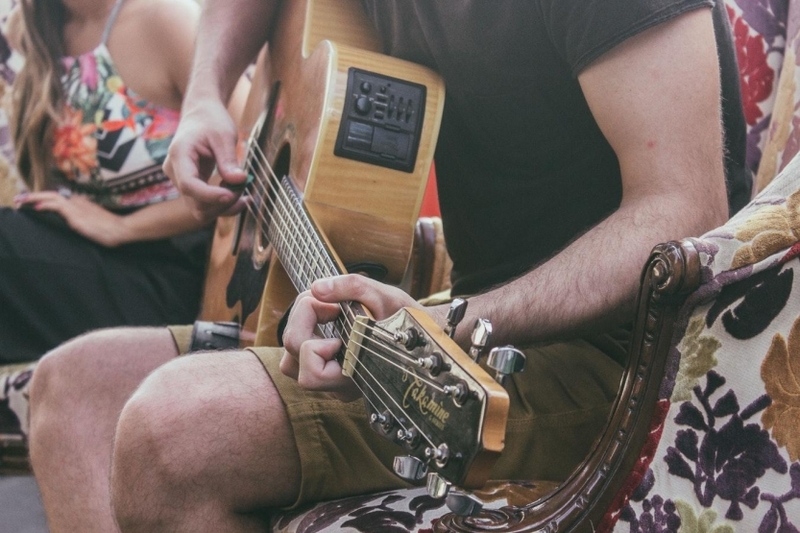 Just like you can make a run on the good ol’ treadmill feel like a breeze by distracting yourself with an episode of Curb Your Enthusiasm, you can do the same when practicing your guitar skills. How so? Simple. Let your right hand handle the remote and popcorn while your left hand switches from one chord to another on the fret board. You won’t get much sound, but what you will do is strengthen your wrist, fingertips and muscle memory. Alternatively, there are ways to still pluck or strum the strings without making much noise, so you can still enjoy your favorite show whilst not missing out on some good practice. There are many different chords, but with the limited space on the fret board, chances are that some chords will have a finger or two in common. Use this to your advantage and keep those fingers in place. These are called your pivot fingers, and they will make your life a lot easier. Not only will pivot fingers allow for much smoother transitions between chords, they will also lend support to your hand as you move your other fingers around the fret board to the next chord. Turns out that sometimes the easy way is the best way. Bet you didn’t see this tip coming. Practice makes perfect, yes, we know. The important part of this is that you need to structure a routine. It’s better to practice for a short period of time every day than trying to make up for slacking by practicing relentlessly for hours at a time. There are practice schedules already put together for you so you can plan a daily 30-minute session. Another important thing to keep in mind is to practice with focus. Make a note of your strengths and weaknesses, and make sure you work on ironing out the kinds every practice session. Keep track of your progress as well, as this will help with your motivation and boost that ego guitarists are so renowned for.